Most of the cars abandoned in Dubai would take pride of place on people’s driveways in the UK so why are the residents of that oil-rich state so keen to just dump their old cars? The main reason why exotic cars are left on the road is that their owners have fled the country. The reason why anyone would disappear quickly without time to sell their prized car is normally to do with the draconian laws that residents live under. For ex-pats the sorts of laws we look at next really are too much to handle. Did you know that being in debt in Dubai can land you in jail? Even bouncing a cheque will get you in trouble with the law. That’s exactly why these superfast and very expensive cars are dumped. Not all are left on the side of the road, most are in fact left at the airport when the ex-pat makes his or her escape from Dubai. Some luxury cars are found with their keys in the ignition, which suggests the sort of panic their owners were in when they decide to up and run from Dubai. 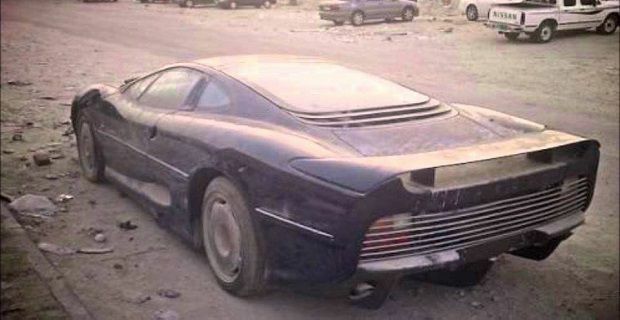 All types, models and makes get left behind including Lambos, Porsches and Ferraris but the most surprising discovery that the Dubai police came across was an abandoned Ferrari Enzo worth a cool £1million. The Jaguar XJ220 pictured in our lead image isn’t in that league but this classic supercar is still worth between £300,000 and £350,000 depending on condition. Last year the Dubai police department found more than 3,000 such vehicles abandoned. The rubbish ones are just scrapped but the policeman’s fund gets a bit of a boost when the super cars and luxury executive saloons are found and sold on.